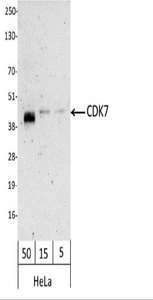 CDK7 antibody LS-C287295 is a biotin-conjugated rabbit polyclonal antibody to human CDK7. Validated for IP and WB. Region between residues 300 and the C-terminus (residue 346) of human Cyclin-Dependent Kinase 7 using the numbering given in Swiss-Prot entry P50613 (GeneID 1022). 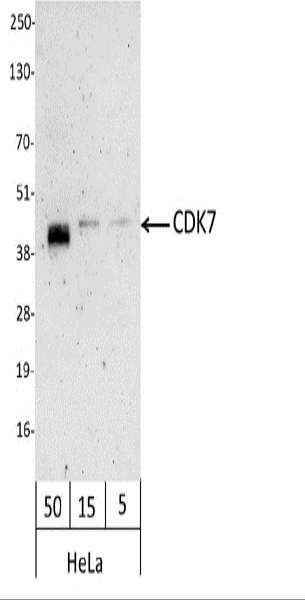 Detection of Human CDK7 by Western Blot. Samples: Whole cell lysate from HeLa (50, 15, and 5 ug). Antibody: Affinity purified, biotin-conjugated, rabbit anti-CDK7 antibody used at 1.0 ug/ml. Detection: Streptavidin-HRP and chemiluminescence with an exposure time of 3 minutes. This image was taken for the unconjugated form of this product. Other forms have not been tested.